hi guys!! or maybe i should say, aloha!! alex & i just got back from maui about a week ago and we had the best time everrrrr! we traveled to maui for our honeymoon 7 months after our wedding. yes, we decided to wait. why you ask?! we got married in june and for those of you who know minnesota in june, why would you want to leave?! it’s gorgeous, lush, & green, and so we decided to wait until january. minnesota in january? waaaaay different story. when we left it was actually quite mild, like mid 30s i wanna say, not bad, right? but when we got back?? it was literally 8 degrees. yes. 8. needless to say, leaving the island to come back to 8 degrees was extremely difficult. we also decided to wait because we wanted to be fully present and enjoy our time, not that we wouldn’t have if we would’ve taken off right away but we went through so many emotions having our wedding that it was almost like a nice reward 7 months later to say hey, we got married, and we’ve had some time to be newlyweds, let’s go celebrate that! i wanted to blog about our honeymoon because i noticed that on instagram our honeymoon post actually got the most likes out of any other photo on buck & rose’s instagram to date. 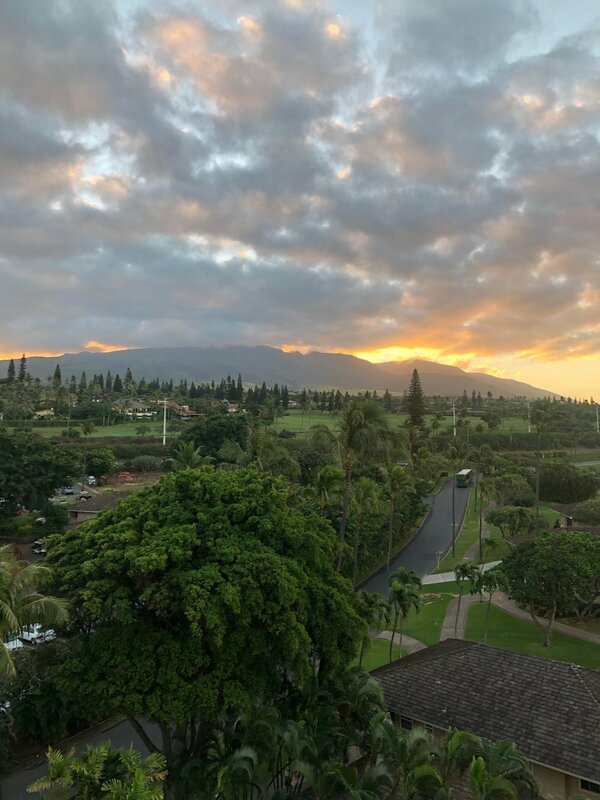 it shows me that you guys like to see the personal side of our lives and i’ve been working on sharing more of that- so with that being said, i’m going to dive right in and share all about maui- what we did, our favorite food, drinks, sights, and more! we flew into maui around 8pm HST and it was dark so we didn’t get to take in all of the beauty that maui has to offer until the following morning. we did have a slight mishap upon checking into our resort (there was a local cannabis convention being held there that we didn’t know about and our room basically smelled like cheech & chong were staying there, (not knocking it if you partake or enjoy that, we just don’t and it wasn’t how i wanted to get our honeymoon started. we were right off the courtyard where the after party was taking place also and it was super loud. not ideal in any regard.) long story short, the ladies at the front desk were super accommodating and switched our room to the opposite end of the resort away from the convention and all was well) but it was solved and we went to bed to wake up early the next morning and enjoy our day. when we woke up the next morning, i opened the shutters and this was my view. ok, this is why we came to maui. we enjoyed watching the sunrise and decided to venture out for breakfast. we went to this little place called the gazebo. it was an actual gazebo! and the line was out the door and then some but totally worth the wait. we had fresh pineapple spears to share and an order of the mac nut pancakes. they were to die for and they were served with a non-dairy whipped topping & coconut syrup! soooo yummy! hawaii is known for producing macadamia nuts (as well as australia) and i love how they use them in so many different dishes! i also had a gigantic breakfast burrito that kept me full the majority of the day, i didn’t even finish it all, and alex had the spam omelette. spam is like a delicacy in hawaii which is so funny to me because minnesota is home of spam. we have the spam museum! and i’ve never tried it, until i was in maui. the mac nut pancakes were by far my favorite breakfast food the entire trip and so on our last day we went back to have one last order. after breakfast we walked down to the water and we saw sea turtles!! i was probably standing too close to one (did you know it’s illegal in hawaii to touch a sea turtle? it’s because they are an endangered species and there are serious laws with big fines if you violate them) but it was amazing to see one so close. we walked along the water and took some pictures and then headed back to our resort. we didn’t have an agenda which i loved because we were able to take each day as we wanted it. we love to go on vacation with some ideas of what we’d like to see or do but we never jam pack our agendas and as a planner this is sometimes difficult for me because i like to at least have some idea of what we are doing by day. i do enjoy this way of approaching our trips though because then you find places organically and it feels so rewarding. it also feels more relaxing. so as they say, go with the flow! after our breakfast, we were off to explore the island! i could go through day by day but this blog would be 8 miles long because i would go into everything i loved about each day. with that, i’m going to highlight our top faves from our trip. Star Noodle- the steamed pork buns, garlic noodles, & singapore noodles are amazing!! i also really liked the kimchi there (which is usually a no go for me) and alex loved the mentaiko noodles. disclaimer: we loved Star Noodle so much that we went back for another meal! Aloha Mixed Plate- the original aloha mixed plate is the best in my opinion. it’s a mixed plate full of yummy white rice, fresh fish (mahi mahi), chicken, & teriyaki beef. all mixed plates are served with macaroni salad, yes, another midwest staple! alex had the kalua pork plate which is also served with rice & mac salad but this plate comes with lomi lomi. it was soooo good that we went back a second time and we switched plates! also they have the best ahi tuna poke. and the mai tais? almost too cute to drink! Monkeypod Kitchen- i read about this place from a blogger (thanks @sassyredlipstick!) and we loved it here! the atmosphere was exciting and i loved the vibe. fun drinks & yummy food. we split the kalua pork & pineapple pizza. i had the fish tacos and they were sooo yummy. i opted for grilled fish for it’s tenderness and they basically melted in your mouth! alex had the fresh island fish sandwich which he also really enjoyed. Maui Brewing Company- we didn’t eat here but we saw the food and it looked super good. the brews were so easy to drink and they had a fun ice bar to keep your beer cold! i loved the bikini blonde and alex opted for his usual IPA selection. his favorite was the double overhead ipa. Grandma’s Coffee House- on our way back from hana, we stopped for a snack here! the cutest coffee shop/deli you could see on the island! i had a sweet tooth so i had a gigantic slice of their homemade carrot cake. i slightly regret not trying their coffee cake because they’re known for it but the carrot cake was calling my name. alex’s snack was the mac salad. it was his favorite that he had tried during our time in maui. The Road to Hana- this famous sightseeing trip is one for the books. we took the back road so there wouldn’t be as much traffic and you also cut the drive time down pretty significantly if you go this way because the entire trip can take up to 10-12 hours there & back. however, i will warn you, if you are afraid of heights or windy roads, this may not be the drive for you. alex drove and thank goodness he did. i was fine for the majority of the ride, the speed limit is about 25 mph the entire way up the mountain after you get past hana highway. however, i did end up having a full blown panic attack. the breaking point was we were coming around a suuuuper windy curve to a one lane bridge connecting the canyon roads together. a. one. lane. bridge. and the cherry on top? a truck was coming right at us!! after the truck passed us i had alex pull over immediately as soon as he could because i could not catch my breath. as i cried for a good 10-15 minutes i didn’t know if i could keep going if the drive was going to be this treacherous. my husband reassured me that we were less than 40 minutes away from the seven sacred pools and that he thought the worst of the drive was over. i said yes to keep going and i’m soooo thankful that we did because we made it to the waterfall. we made it to the seven sacred pools. Lahaina- this is the general area of where we stayed near our resort and we loved the area. grocery stores, coffee shops, and general stores are all close by which made it convenient to stay near here! Kaanapali Beach- this is the beach that our resort sat on. The tides were high the last few days of our trip so we couldn’t swim but the day that we did swim, was pure bliss. The ocean water was crystal clear and it felt so good to be in the warm sun! Front Street- this is definitely the more touristy area but still very fun! my favorite was walking up & down the street shops. there’s also really fun art galleries to check out and local boutiques and restaurants. ululani’s shaved ice was a must with mac nut ice cream in the bottom- sooo good! Whaler’s Village- loved this upscale mall! we went here when we went to monkeypod kitchen for dinner and also when i realized that i didn’t have anything long sleeve to wear on our flight back to mn. Whale Watching- you can do this pretty much anywhere in maui and it is incredible. they do offer sightseeing excursion boats as well but we just watched from where we were on land/sand. i think the best spot was at the gazebo restaurant where we had breakfast. Scenic Overlooks- no reason needed. we were all about those views!! so as amazing as all of the places above were, honestly what i loved most was being in such a beautiful place with my husband. we felt so relaxed and it was such a great feeling to just be present with each other. no distractions, just us. we loved maui so much that we talked about making it our yearly vacation. i love to explore new places but maui has so much to offer. the next time we go, i do want to take a day trip to some of the other hawaiian islands. what’s your favorite hawaiian island and why? be sure to tell us in the comments! for now, mine is maui and i have a good feeling that it will be forever. be sure to follow us on instagram @buckandroseweddings for more of our honeymoon posts, tips, & tricks on how to plan your perfect honeymoon, too!